Marquette, known as North McGregor, was first discovered by Father Marquette and Louis Joliet on June 17, 1673. In October 1800, the Giard Tract land grant was given to Basil Giard. It was one of three Spanish land grants in what is now Iowa. North McGregor was incorporated in 1874 and renamed Marquette on March 29, 1920 (Pop. 850). 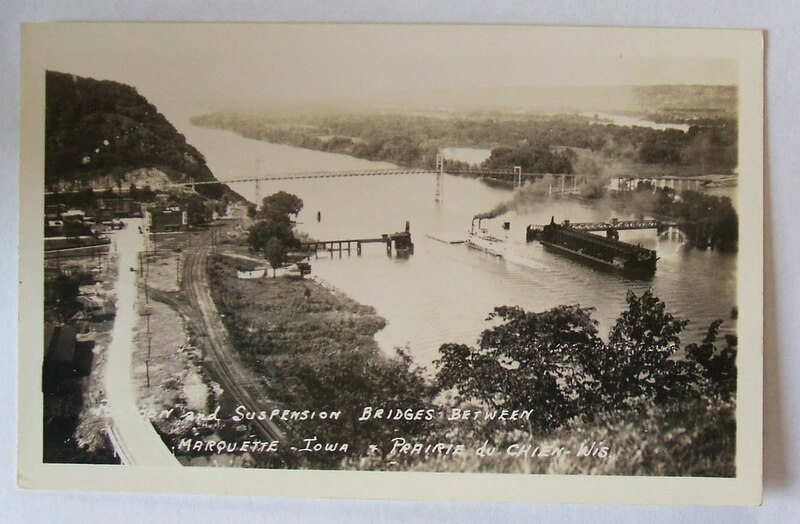 In 1920, Marquette was the largest railroad terminus in Iowa and the railroad yard employed over 400 (CM ST, P.P. RR). There were many established businesses and two churches. Marquette has experienced several floods. Two destructive floods wiped out homes and businesses in Marquette in 1965 and 1916. The highest river stage of the century (25.38 ft.) happened during the flood of 1965 and the river surrounded the entire town of Marquette. The Corps of Engineers furnished an Army Duck for transportation. 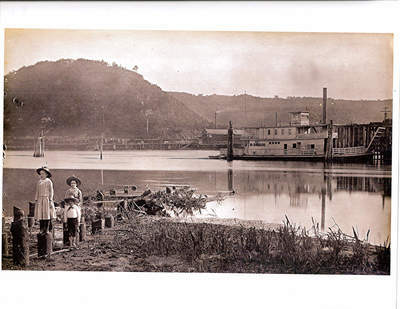 The railroad pontoon bridge was built on April 15, 1874, and was the largest of its kind in the world. It was discontinued October 31, 1961 due to expensive maintenance fees. Two days later tug boats removed the 275 ft. long pontoon, dismantled it, and took it to Lacrosse, WI. The car suspension bridge connecting Prairie du Chien, WI and Marquette, IA was dedicated June9 – 11, 1932. At that time, it was the only suspension bridge crossing the Mississippi River. 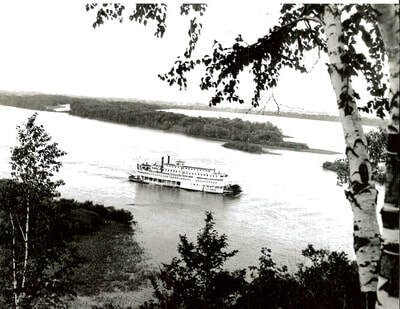 Prior to the bridge, Marquette had three ferries named the Wanamingo, Lorese, and Rob Roy. Each boat carried 12 cars and made seven to eight trips daily. The suspension bridge was officially closed at 1:00 PM on Thursday, November 14, 1974, two hours after the dedication of the Marquette-Joliet Memorial Bridge. The suspension bridge was dismantled in 1975. The new bridge was closed for repairs due to faulty steel on January 17, 1981. Marquette residents depended on boat service and car ferry service for about 9 months, or they would travel 30 miles north to Lansing or 60 miles south to Dubuque in order to cross a bridge and enter Wisconsin. The schoolhouse was dedicated January 18, 1924 and housed grades K through 12th. When area schools consolidated with McGregor in 1952, the upper grades were bussed to McGregor and grades K through 4th from both towns attended school in this building until June of 1986. It now houses an antiques mall . A mayor, five council members, committees, commissions, and city employees operate the city. Presently the city is dependent on tourism. Gencor-Bituma is a major employer in manufacturing. Present population per the 2010 Census is 462. Police, fire, and rescue (EMS) independent services are exclusively created and contracted to share services between Marquette and McGregor under 28E agreements.